Whereas rising damp can only occur where moisture is rising from ground level, penetrating damp, can occur anywhere in the fabric of the building, either horizontally or falling. This occurs where the face of the external bricks becomes, or is porous. The bricks absorb water and during cold periods, where the water freezes it will expand and the result is spalling of the brick surface. This then allows the bricks to absorb even more water during periods of wind-driven or heavy rain. Where frames are not properly sealed between the frame and the brick surround, water ingress will occur, which leads to tell-tale signs of dampness on the inside of window and door reveals. Easily forgotten but a constantly leaking overflow pipe can cause substantial wetting of walls. The remedy may be simply adjusting or replacing the ball-valve in a cistern or water-tank. 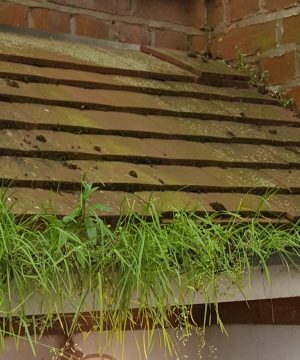 Defective rain-water goods such as blocked guttering and down pipes, blocked hoppers and issues with roofing such as malfunctioning flashing etc. This is one of the main causes of water ingress above ground level and can lead to very significant damp and timber decay (dry and wet rot) problems internally. When the weather is good, people tend not to think of external rainwater goods. The best time to check all the gutters, down-pipes, hopper heads etc. around your property is when it is pouring with rain. Grab an umbrella and walk around your house to check that gutters, down-pipes and hoppers are not over-flowing or leaking. It is worth getting wet for! If damp-patches increase or become darker following rain-fall, this suggests that the cause of the damp is related to rain penetrating the property. There may be drips or puddles beneath the area and visible staining may occur in the area, which is usually green in colour. 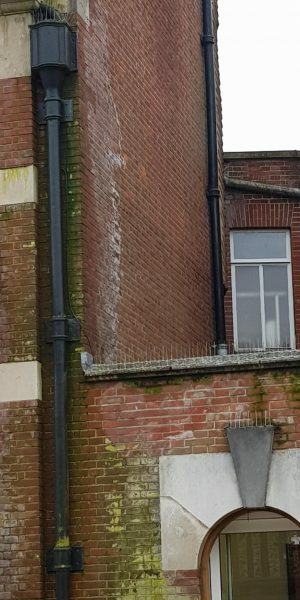 Penetrating damp can be prevented, to some extent, by ensuring that your property is well maintained externally and that gutters/downpipes are regularly inspected and cleaned. This can include checking poorly fitting joints. Any storm damage should be addressed as soon as you become aware of it. 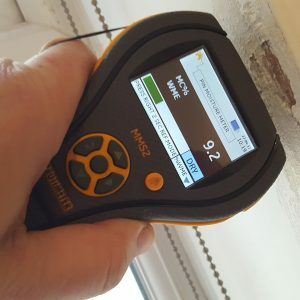 If issues are not rectified when they first become apparent, then additional problems such as timber decay to timbers adjacent to damp masonry may occur internally. Often water can also become trapped behind the external renderings, which has suffered from cracks or where the render has blown and become hollow from the substrate. This then means that it therefore has no means of escape, leaving evaporation and drying to pass internally.